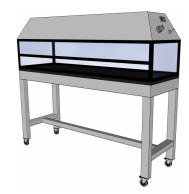 With LOC’s Portable Fume Hood, remote control valves have forged brass valve bodies for strength and durability. Valves for gas, air, vacuum and special gases are of needle type design with a stainless steel floating cone and replaceable seat. Valves for steam service have a flat Teflon valve disc and stainless steel replaceable seat. Valves for water service have a renewable unit including a stainless steel seat and volume control. All outlet assemblies are furnished with a color coded epoxy acid and solvent resistant coating.